Doll houses are magical in how they light up imagination and make us feel like tiny explorers in a tidy, diminutive world. 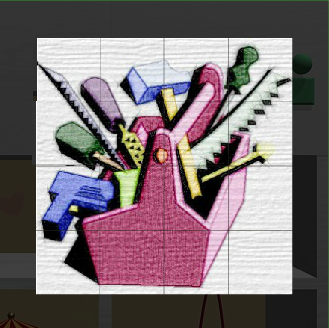 By not only including a doll house, but letting us open up, explore and play inside it, TomaTea has waved a wand of wonder over their newest escape-the-room game, Dolly House Escape so that every step feels more special, even as you grapple with some of TomaTea's most enigmatic puzzles. When you begin play, explore the room for signs and symbols that will lead you to the dollhouse key. TomaTea's signature glowing cursor and "I have no clue how to solve this" messaging are much appreciated guideposts in this mini adventure. You can highlight to use an item or click its "?" icon to examine it more closely. Needed information is often secreted away or so well coded that you'll have to think more deeply to solve some codes until you open the door and go outside to play. Although this isn't a four walled room, and so you won't need to turn or move about as much as zoom in or zoom out of areas, details abound in niches, cubbies and alcoves. It's enough to revive the unfettered curiosity of childhood dreams, so take your time and sink into this inviting place, settle down for a cup of tea, and play house! 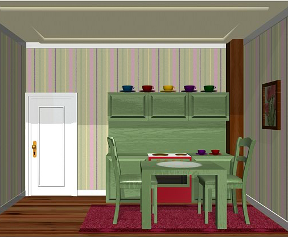 Dolly House Escape Walkthrough now available! Zoom in on the pink doll; note the symbols on her dress. Then, check out the blue doll's dress, noting those symbols. The books above the door look interesting but they're too high. When you get it open, take the SCREWDRIVER from inside the cupboard. Look through the scrapbook to find several clues, which we'll get to use now and later. Back up from the books, taking the STEPLADDER with you. Set it back down on the right side of the wall shelving unit (slightly under the doll house). Leave it there for now. When you get this cubby open, take the CLOVER KEY. In the bedroom you see a picture of three flowers and a wardrobe that's tied shut. The bathroom has a sink that really works! The kitchen has a stove that also works, once you solve its code...but you have nothing to cook at the moment. The livingroom has an umbrella stand by the door. Examine the umbrellas for another clue. When you open the middle cubby, take the BATTERY. Click its side to view its battery slot. Insert the BATTERY. Then turn back to its front and click the tiny green button in the lower left corner. Make note of the pattern you see. In the upper left edge of the screen, when you're looking inside the whole dollhouse, you'll notice a little LIGHT. Take it out. Now replace it with the BLACKLIGHT BULB. Something changed in the dollhouse bedroom! Use the KNIFE to open the wardrobe. Get the ENVELOPE and open it to find a LETTER. Read the letter for a clue. Fill the TEAPOT in the bathroom sink. Set the TEAPOT OF WATER on the hot burner. It'll begin to steam. Holding the ENVELOPE over the steaming teapot to loosen it, take the STAMP off the envelope. There's something written on the back of the stamp that's too tiny to read. Back up twice. Let's see how long you've been playing this. Oh my! Look at the clock! The date on the front of the stamp is just a red herring, ignore it. All you need is a page from the scrapbook and the clock. Open this cupboard and take the MAGNIFYING GLASS. Using the magnifying glass, read the back of the stamp. Back up from the bed, turn to the french door, and use the STAR KEY to unlock it. Go outide to play! Quick and easy escape from Tomatea, I love their games. for some reason my pc won't read .png could you convert it to a .jpg or .gif or something? I'm sorry, Paul, but png is an industry standard image file format. You might want to find out why your computer doesn't read pngs and fix it. We are moving to png images for virtually all our articles. Maybe the problem is same message I have when I try to see screenshot: The requested page could not be found. That was cute. My only problem was the inconsistency in the "too high" places. One of them said "too high" unless you had placed the right object in the right place first. One of them was unresponsive to clicks unless you had placed the right object in the right place first. Generally I found maneuvering from one view to another to be less intuitive than usual. I didn't see an inconsistancy in "too high" or not too high, each had to do whether you could climb up on the bed or not. I did find inconsistency on a couple codes in which you couldn't click until you saw all the clues, rather than the more TomaTea famous: "I have no clue" message. Playing again, though, that issue didn't come up. I hope no one else is finding a problem there. I just realized after I posted that that what I meant was there was no such image because it didn't look like the image was uploaded. If you could do that soon, that would be great. Really needed the hints for this one :D Loved the dynamic dollhouse ~ so clever! Wow, I never would have figured out the clock if not for the hints in this walkthrough. Had all the clues, just couldn't put them together. Thanks!